Western and Southern states hold some big bass and Lake Wohlford in Escondido, California is no exception. The lake holds some monster fish including a 19 pound, 3 ounce largemouth as the local record. There are plenty of double digit bass out there as well but this fish is definitely one that hasn’t been seen in recent years. 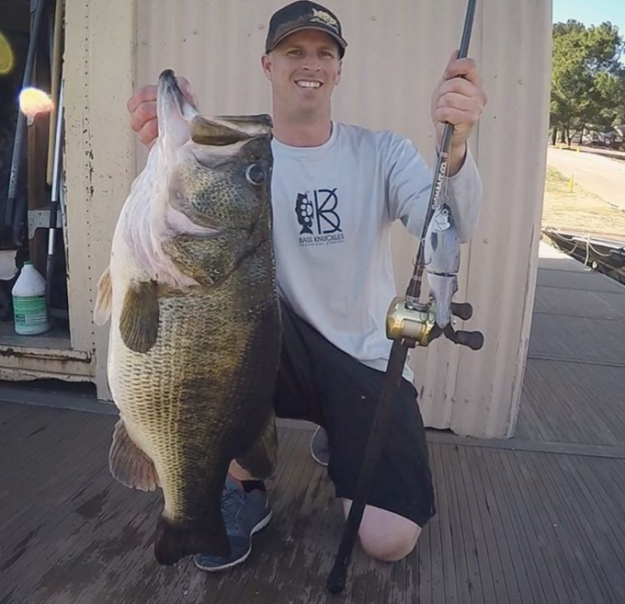 Last Friday, Greg Springer of Vista, CA caught this giant 16.3 pound bass that is the best that the lake has seen in a while. Springer was fishing for this exact fish that he had seen twice before in February while he was out on the water. On Friday though, the lake was still and he set up in the same area that he had previously seen this lunker. The fish came up to the top of the water and he missed it, but he didn’t give up. The wind started swirling and churned up the water and Springer casted back in. The giant bass crushed the 3:16 Lure Company Glide Bait on the first cast and Springer was able to reel in the fish of a lifetime. Springer told SDfish.com that when he saw the wind switch and the water start moving, he knew it was go-time. Springer is no newcomer to big bass. He’s managed to catch 3 bass this year that top double digit pounds and caught this 16.3 pound monster fishing from shore. See more big fish articles on MorningMoss.